Located within a Hoxton backstreet away from the main drag, acclaimed bartenders Ryan Chetiyawardana and Iain Griffiths opened The White Lyan a couple of years ago, reinstalling life into an old East London pub. At present, the drinking scene in London is remarkable, especially in the east, yet as is the case with most anything, although already spoilt for choice, the city’s most discerning drinkers are constantly searching for new dens to frequent, bars that are trendy and serve social media picture-worthy offerings. By now, the whole world has witnessed the ageing Tom Cruise-inspired theatrical cocktail shaking cliché. Even chain restaurants such as TGI Friday employ bartenders to perform boastful mixing processes, even leading to the occasional dropping shakers filled with liquid so artificially coloured that it seems just as palatable as harsh cleaning products. It’s time for something new and exciting, something that has certainly been delivered by The White Lyan with its unique concept and approach to modern mixology. 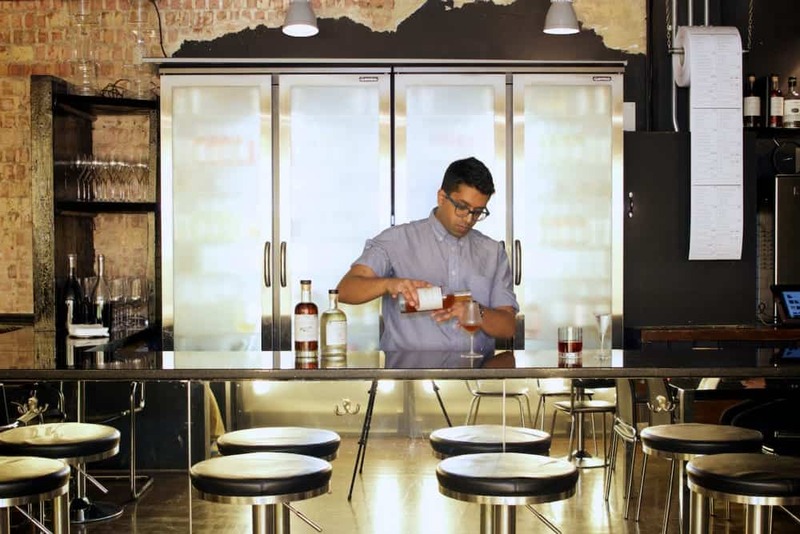 In an attempt to produce drinks that taste the same every single time, and to cut down on waste, customers will find absolutely no ice, fruit, or other perishables behind the bar. There’s not even a cocktail shaker in sight, instead all of the drinks are pre-batched (some are even available to take home) in order to allow the fast service to allow staff to interact with guests juxtaposed to spending 10 minutes stirring an old fashioned or martini. There’s also a particularly strong focus on the bar’s own house spirits, with a compounder’s license that allows the team to source raw spirits from distillers, which are then adapted and diluted to specification, while the likes of vinegars and cordials used as souring agents to replace citrus fruits. As a result, the bar is not stocked with hundreds of botanical London gins, or with an eclectic range of craft beers. Instead, the mirrored bar is backed with fridges that store the drinks at the perfect temperature, to make up for the lack of ice, illuminating the bar’s simple, sleek black decor. Everything served here is printed on the menu: even the water is specially modified and filtered with charcoal. At first, this does all seem overwhelmingly pretentious, but the concept does, conversely, work intrinsically well. As for the drinks, the menu features ultra-modern twists on well loved classics – a Bone Dry Martini, for instance, comprises a blend of Mr Lyan’s vodka with bone tincture that’s made from the process of dissolving chicken bones in acid to lend a chalky, mineral texture. Meanwhile a Beeswax Old Fashioned features honey-sweetened Scotch, bitters and beeswax egg that lines the bottle. A new cocktail, Tennessee Nitro Martini, worked as a highlight during our recent visit, nonetheless: a collaboration with Jack Daniels, combined with coffee and cola syrup. 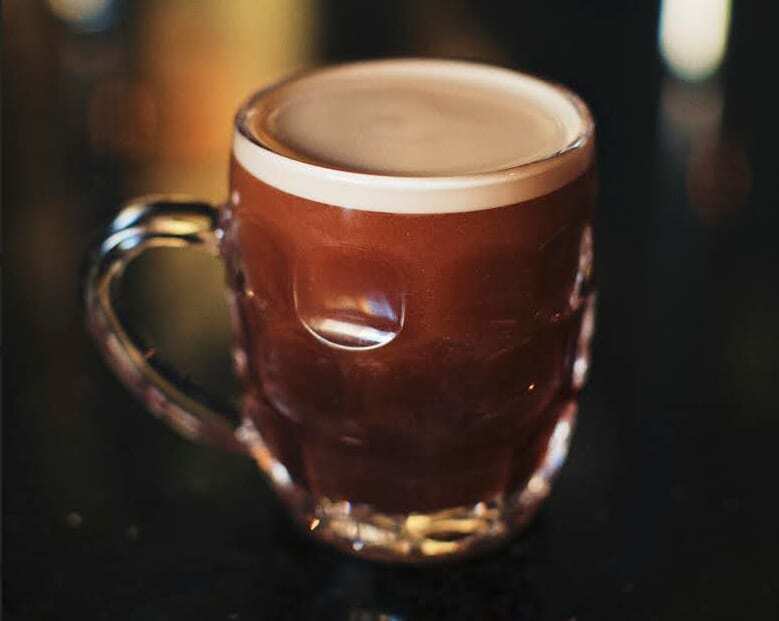 What’s more, the drink is served on tap and made using liquid nitrogen before being pulled into a half-pint mug, reminiscent of a pint of Guinness both in looks and texture with its creamy body and a foamy head, or crema. An ingenious blend of harmonising flavours, coalescing the rich bitterness of coffee with the sweetness of cola, and the taste of whiskey juxtaposed to the more traditional vodka used to make an espresso martini. In many ways, The White Lyan is like the Heston Blumenthal’s Fat Duck of East-End cocktail bars, with such meticulous attention to detail as well as rapidly evolving solutions to add to the DIY concept, reminding visitors of the many reasons why The White Lyan has been ranked as one as one of the 50 best bars in the world since opening. Cocktail classicists are unlikely to approve, yet to everybody else over the age of 21, the drinks here are well worth the trip to the less trendy end of Hoxton. The White Lyan can be found at 153 – 155 Hoxton Street, London, N1 6PJ.